If you haven't heard it already, you're going to hear it again. If you are eligible and registered to vote today, there's no excuse for you not to. Let your voice be heard. I overheard a piece of a conversation yesterday between two people, one who was planning on voting for Obama, the other for McCain. And they (albeit jokingly) said that they should just agree not to vote and not waste their time. What a horrible way to look at our electoral system! I voted absentee last week, and I haven't yet told anyone who I voted for. For all you know, dear reader, I could have canceled your vote. Should that matter to you? On the contrary, it shouldn't cause you to do anything different but place your ballot as you were going to anyway. If you happen to agree with me, great. If not, fine. At least your voice will have been heard. Obama or McCain, I really couldn't care less who you particularly vote for. I mean, obviously, it does matter who is elected, and so your vote does matter, but your particular choice isn't going to make me think any higher or lower of you. When you vote, whomever you vote for, it matters to me that you do so consciously and not blindly. You should actually think about all of the many issues at hand (taxes, economy, social security, foreign policy, health care and education to name only six)... and then make a decision that you're most comfortable with. It may sound at first glance like I'm referring to those who are seemingly enamored with Obama, but there are just as many "McCain-iacs" out there who aren't looking at the issues. Likewise, there are just as many people on both sides who actually know what they're talking about and have made an informed decision one way or the other. I know no candidate is perfect, and quite honestly, neither candidate will be best for all of the wide range of issues we must consider. But it is my belief that one should be able to justify to oneself why they voted for whomever they did in every category (or at least be willing to concede in a few cases that you can't have it all). If you can't do that... well, you still have every right to vote however you choose, but maybe you should reconsider your options one last time. I may never ask you who you voted for to see if you can defend your choice. Most likely, no one will. But you should be accountable to yourself. Pro-McCain, pro-Obama, I don't care. Pro-thinking is the way to go. This is the closest most of us get to running the show. Don't mess it up for stupid reasons. Think... and vote. Polls are open in Pennsylvania until 20:00 EST. 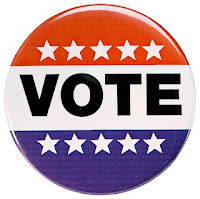 For customized local voting information, click here. Random tangent 1: Yesterday, I was handed a bag of Doritos as part of a "get out the vote" campaign. It read: "Two parties, one America. Ranch and Pizza Cravers." And in my oh-so-perpetual 24-hour-laggy-wittiness, I realized that I was in fact registered "Salsa Verde." I should be offended. I think it's crazy that also, we must note that Obama and McCain...the presidential vote...it wasn't the only one. There were plenty of state issues to vote upon, senators, representatives, governors, etc. The presidential election is yes, the most important, but this election includes many others as well. There was markedly less of that in Pennsylvania then there was in Ohio this year... but yes. In fact, those races probably will prove to have been more important. To be honest, I was just sick of all the presidential politics. I got handed two of those.